Trollbeads: Trollfest 2018 at Trollbeads Gallery! 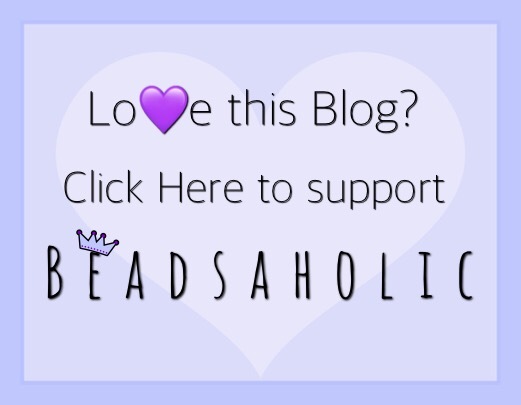 Today Beadsaholic brings a review of the Trollfest 2018 Event Bead and Event details! TrollFest is coming up fast on October 5th and 6th, 2018 at Rogers Gallery in Mattapoisett, MA.. If you can make it to this event, then I urge you to do so! Trollfest is one of the longest running annual events and always have a huge assortment of hard to find beads available to their attendees. The last two events Trollbeads Gallery has offered a beautiful Longevity as their event bead, first year a teal longevity, last year a black longevity and this year will be a stunning purple longevity! Of course, I love this bead as purple is my favorite color and honestly purple is harder to find with Trollbeads compared to other colors. Today, I have a review of the Event bead and an outline of the event itself. I hope many of you are able to go and I look forward to seeing photos on social media. This first photo is one of my favorite ways to wear the purple longevity and will be repeated throughout Autumn and Winter as it’s such a perfect color composition. I have paired the longevity with some of Trollbeads latest collection the Polar Dreams, Angel Wing Alunite, Maple Leaves, Foxtail Spacer and Crown of Leaves Spacer on a Trollbeads Bangle. We have had a rainy September, so there hasn’t been much sun to really show off the purple in these beads, but I think this photo shows the rich dark purple! The Longevity is a standard size ranging around 14 mm high x 7 mm wide. 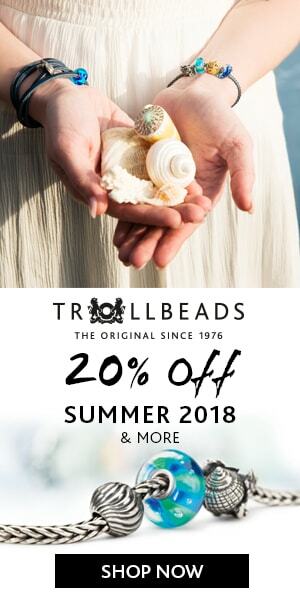 Below you will find the Event details provided by Trollbeads Gallery. First off they are offering Buy 3 Get 1 Free to help you make the most of your Trollbeads dollar! There will be hundreds of unique Trollbeads available and of course Louise has been saving special uniques just for the event! They will also be offering the following specials. free $46 chain with a purchase of any upgraded clasp! two free silver stoppers with a purchase of any silver or gold bangle. 25% Off all Fantasy Necklaces and all Fantasy Pendants. 25% off all Gold items including Gold Bangles. Silent Auction for Charity will be held once again! Each year Trollbeads Gallery raises over $1000 for charity from beads they donate. In 2016 Trollbeads Gallery donated $1200 to the American Cancer Society and in 2017 they donated $1000 to the Puerto Rico Crisis. Closer to the event they will announce the recipient for 2018. So far they are offering the following beads for this year’s auction. They will be adding more so be sure to check their site and follow Trollbeads Gallery on Facebook! Louise will be adding photos of the auction beads on the Trollbeads Gallery Website <here>. Mother’s Rose (pink) a new addition donation from a friend/collector. Photos from Trollbeads Gallery of some of the Auction beads. There is no entrance fee for this event but please let Louise know if you plan on attending because you will receive a gift at the event as a token of appreciation. 9:30 Doors open and bead play begins! 10:00 – 5:00 Two bead artists trained by Lise Aagaard will be exhibiting their glass bead making skills! Have a seat and watch the remarkable process unfold. 12:00-1:00: Lunch offered. Sandwiches buffet style. 4:00 -6:00: Wine and Charity Bead Auction. On Saturday the Global CEO from Denmark, Patrizia Christensen will be the guest visitor! 9:30 Doors Open and Bead play begins anew! RSVP’s: Let Trollbeads Gallery know if you are coming and if you would like to have lunch with them. It helps Trollbeads Gallery plan for food and help! Feel free to email Louise at louise@trollbeadsgallery.com. The Purple Longevity looks really nice with the new Northern Lights Magic, Turquoise Prism, Lightning Bud Spacer, Crown of Leaves Spacer, two Lotus Tops. How about a witch’n bangle with the Event Longevity, Trollbeads Amethyst, Witch Shoes, Maple Leaves, Foxtail Spacer and Crown of Leaves Spacer. Of course, they mix with some old retired Trollbeads, too. I have mixed the Purple Longevity with some wine colored Trollbeads. I think the purple shade goes well with a more wine color or a more amethyst purple. I have taken up-close photos of each part of this bracelet so that you can see the beads I’ve used a bit better. As you can see here, it’s a pretty purple. Over all, this event is sure to be a blast! As you can see by the outline this has been planned out perfectly. The Purple Longevity is a must have for any purple or longevity lover. Now for some important links. That full bracelet with the wine colored beads is amazing! I have gone to the last two events, but can’t make it this year-hopefully there will be some event beads left over for purchase online, though I don’t think they listed any last year. The event bead is lovely though I wish it were a different color or shade, since it is so close to last year’s (black) color. A lighter wine or golden shade would’ve been lovely, but this one is so dark, you almost can’t tell it’s purple. Thank you for the article. Hi Tanya! Thank you 💜 Yes, it’s a darker purple, but in person you can tell more that it is indeed purple, especially in the sunlight. Fingers crossed you will have a chance to buy online after the event. I don’t remember if any made it to the site last year, I believe a few made it but it was closer to November. Hi Janelle, yes! Sure to be a great event. Yes, the purple longevity is the event bead and only available at Trollbeads Gallery.